Natural Rubber Speed Hump replaces the conventional concrete speed hump. It is easily fixed and dismantled conveniently as and when one wished. 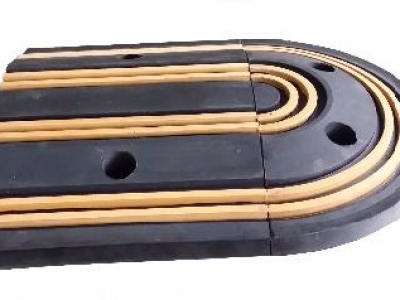 Natural Rubber Speed Hump is designed to reduce vehicle speed, built for long lasting and cost efficient. Display shown is Natural Rubber Intermediate Piece Speed Hump 350mm (W) x 50mm (H) x 250mm (L) and End Cap Piece Speed Hump 350mm (W) x 50mm (H) x 175mm (L) that comes with EPDM yellow strip lining ~ Front View. Optimum Resilience, High Elasticity & Stretch Strength, Corrosion Immunity, Excellent Weather Resistant, High Mechanical & Tensile Strength, Long Life Span, Immune to Acids, Alkaline, Metals, Salts, Chemical, Non Hazardous, High Elongation At Break, Stable Colour. Natural Rubber Speed Hump by Flexijoint Industries, market and sale by Flexijoint Industrial Marketing & Services, Kuala Lumpur, Malaysia.